Open Food DNA is a concept project that stems from the interest of Hackuarium members in food, genes and openness. You will find a concrete example in the form of BeerDeCoded. Citizens are increasingly confronted with issues related to DNA data collection and interpretation. Following a steep decrease in costs, the sequencing of DNA is now a routine procedure. Whole genome sequencing and genotyping are typically used in genomic studies, microbiome analyses, diagnostics, drug development, environmental monitoring or forensics. Alongside public health initiatives and academic research projects, for-profit companies such as 23andMe or uBiome sell personal kits, collect genetic data from their customers and provide personal information in return. Yet, there is a lack of education about how this data is generated and what it is subsequently used for. Using food DNA as example, our citizen science project aims at providing unbiased information about DNA sequencing technologies to the general public. Our initiative includes data collection, processing, interpretation and dissemination. We choose food because it allows to avoid the many pitfalls related to health data, such as privacy and regulatory issues. To foster participation of the public, anyone will be invited to submit food samples for DNA analyses and will be in turn rewarded with access to the data and knowledge generated in its entirety, without restriction. Open Food DNA is a project lead by members of the Do-It-Yourself biology (DIYbio) community Hackuarium. We collaborate with other DIYbio communities, as well as institutional and industry partners. This collaboration provides key elements and expertise in DNA data generation, analysis and visualisation. All stakeholders willing to increase public understanding of technologies related to DNA sequencing are invited to join. In summary, we build a workflow, from food to data visualisation, that enables citizens to understand what they are eating. All data and processes developed as part of the initiative will be free to access and free use for everybody. Demystify and explain genetic data. Food does not involve privacy issues. Produce an open access knowledge database. Enable art and science using open data about geographical food habits. Switzerland is amongst the world’s most productive countries in terms of research and innovation. At the same time, our direct democracy can create pseudo scientific drifts. Citizens have a direct impact on the future roles of genetic technologies in our economy and society. Our project demystifies DNA science and triggers a public interest for topics usually confined to R&D departments. We want to let people engage in science and make more informed decisions. We choose food because it allows to avoid the many pitfalls related to health data, such as privacy and regulatory issues. In addition, food concerns everybody. People are curious about what they eat. Some have health, religious or ethical reasons for avoiding certain types of food. But we have limited knowledge about what exactly composes our diet. Today's information comes from the suppliers who themselves rely on their suppliers. Is a dish really containing what is written on the label? Where do the ingredients really come from? Does my food contain allergens, GM crops, etc... How much more complex is it than what the label says? We cook and eat animals (meat, fishes), plants (vegetables, spices) and fungi (mushrooms, yeast). These are all life forms, thus our food is full of DNA sources. The analysis of DNA is a unique way to decode a recipe. With DNA, it is possible to identify, classify and count all the species present in a food serving. Moreover, this is a direct scientific test done a posteriori as compared to a list of ingredients that is alleged a priori. In a portion of lasagna, ground beef and horse meat may look similar, but their DNA differs and can be identified through sequencing. The consortium barcodeoflife.org has made a list of unique DNA identifiers for 300,000 species collected around the world. We have access to these data and to the technology to interrogate thousands of different DNA species in a complex sample. By making all the data generated by the project open, we want to explore and promote an alternative to proprietary initiatives. Open data supports literacy and foster innovation by both citizens and scholars. Thanks to a steep decrease in costs, DNA analyses are more widespread. Yet, the public does not completely understand the potential benefits and challenges related. Private companies collect genetic information from customers. Recent food scandals have been shaking citizens' trust. This confusion leads to nonsensical outcomes. For instance, 80% Americans support “mandatory labels on foods containing DNA” (source: okstate.edu). To improve the global impact of DNA technologies, it is crucial that citizens understand them better. Unfortunately, intellectual property and privacy issues are also rarely discussed. Health related data is a sensitive topic, preventing abuse requires a citizen's literacy. Our project educates citizens on the issues related to genetics testing using food as an example. Gianpaolo Rando leads the Open Food DNA project. He holds a Ph.D in biotechnology and has 10 years of experience at the interface between genomics and nutrition. He is a proud member of Hackurium, has a passion for food and drinks and wants to expand the project to beer and other beverages (fb.com/BeerDeCoded). The community that could be potentially involved includes several DIY biology and open science communities in Switzerland and in Europe. Each step of the Open Food Data can accommodate external partners who are eager to support the project and increase its impact. We recruit food explorers through our network that includes Swiss and International DIY communities and partners. 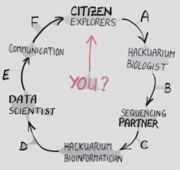 For a pilot experiment, the 30 members of Hackuarium will be the first explorers. Each food explorer receives a collection kit. This kit contains detailed instructions on how to homogenate the food in presence of DNA preservatives and how to ship the sample to Hackuarium with a pre-paid envelope. At Hackuarium, we will collect the sample and extract DNA using standard laboratory techniques. We will prepare amplicon libraries of the food samples (mitochondrial and chloroplast DNA barcodes). We are equipped to run PCR using indexed primers that allow multiplexing and next-generation sequencing. (If there is a need, Hackuarium could organize biohackademy workshops to transfer this open technology to other DIY communities). We send the DNA library to a partner for next-generation sequencing. We receive sequencing results in large digital files that are the input of the bioinformatic pipeline. We publish this raw data in the open. Hackuarium members with bioinformatics skills develop a data analysis pipeline to identify and quantify each food DNA, effectively decoding the recipe of any dish. This pipeline is composed of demultiplexing, trimming, quality control of sequencing and filtering steps. The reads are mapped to rRNA and mitochondrial databases (barcodes), to produce a processed data table. We publish the pipeline in the open. Hackuarium data designers implement novel data visualization and communication strategies to make food DNA understandable to anyone. Current genomic visualisations include complex phylogenetic trees, PCA, geographic map based on metadata, or taxonomic pie charts. The design is released in the open, for anyone to share. Inspired by Dante’s Convivio in which people exchange knowledge during a banquet, our workflow uses food DNA analysis (the banquet) to generate six different interactions opportunities between scientists and citizens. Our goal is to exchange knowledge. Communication experts in our community will promote this dialogue using social media and social formats like hackathons and conferences organised to discover the food genetic information and raise awareness around related issues. The power of working with a community of talents in a fully equipped laboratory allows carrying out most of the development and analysis steps at no cost. In order to make this project a success, all members and partners of Hackuarium are giving their time and expertise for free. However, steps A, B and C will involve costs related to buying consumables and outsourcing some analyses that are not possible in our laboratory at the moment. Steps D, E and F should not involve any costs and will be carried out by the community. Here are the details for each of them, as well as a global costs analysis for 100 samples. We need send out 100 kits for food sampling with a return envelope, for an estimated cost of 10 CHF / kit. Includes plasticware, DNA isolation reagents (Tris, silica), and PCR reagents (primers, enzyme). Includes one Illumina MiSeq Lane (paired end). Total costs for 100 samples are therefore estimated to be around 5500 CHF.